In photography, diagonal lines can have a very powerful effect on the composition of an image. They create a point of interest for the viewer as they intersect with other lines, as seen in Gerry Suchy’s picture below. 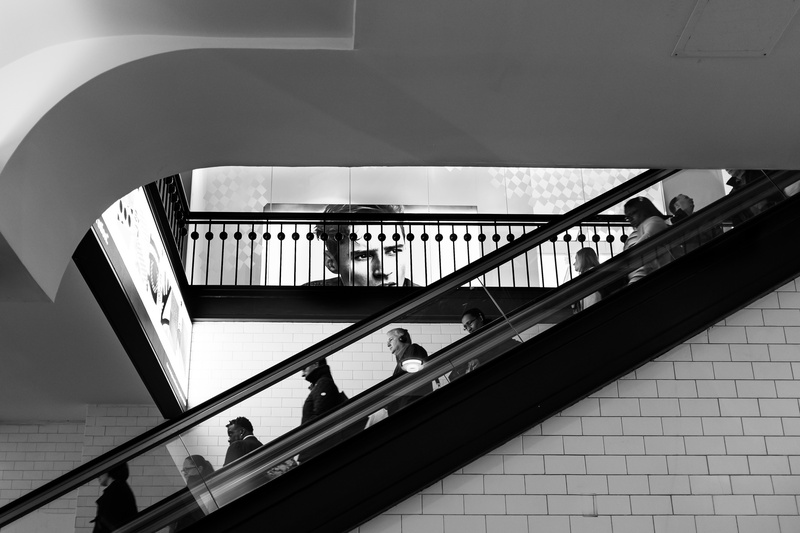 In this work, the stark black lines of the escalator cut through the horizontal lines of the tiled wall, drawing the viewer to the figures on the escalator. For many, the movement of the diagonal line in the frame from the bottom left to the top right is a natural direction for our eyes to follow, an association typical of people who speak languages that are written from left to right. Winter is a beautiful time for amateur and pro photographers to practice their techniques and capture some great seasonal images. 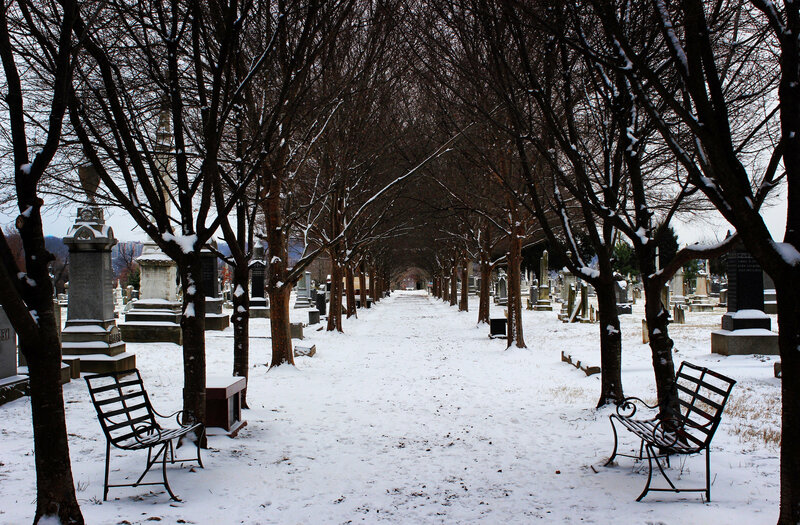 Here is a nice shot that was taken by Jim Havard earlier this month in DC’s Congressional Cemetery. This photo is also featured in a blog post for the Greater Greater Washington. 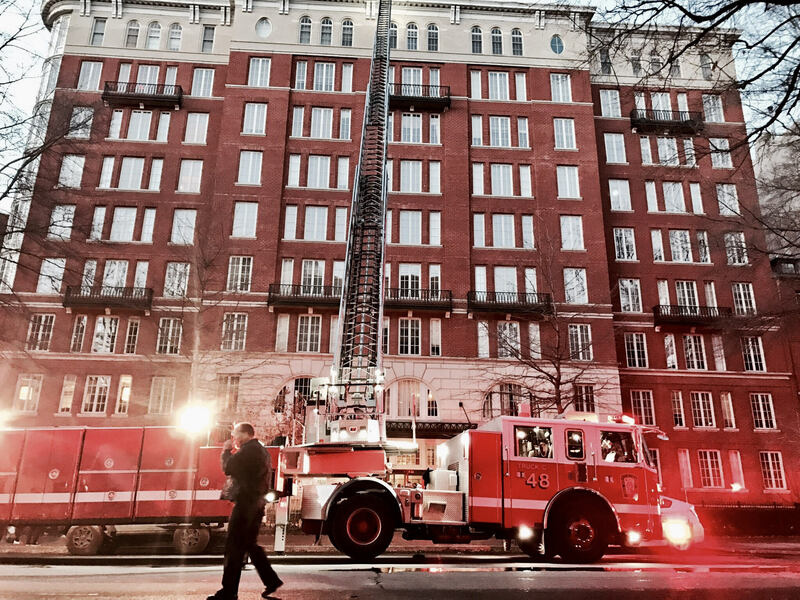 Note that taking photos outside in the winter can present some risks for your gear. Sudden changes in temperature can lead to condensation on internal electrical components, which could damage your camera or lens. Before coming inside after a cold-weather shoot, put your camera and lens in an airtight plastic bag and don’t remove until everything is at room temperature. Any condensation should form outside the bag instead of on your gear. B&H has some additional tips for cold-weather photography. Different than typical street photography, capturing images at protests or rallies often allows the photographer to get up close and personal with their subjects, who expect more media attention than usual as they try to raise awareness. 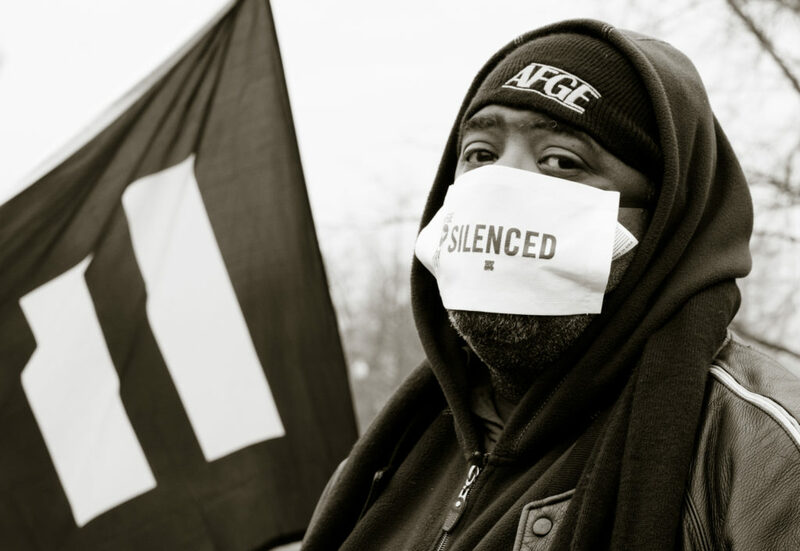 This image taken by Victoria Pickering features a rally member outside of the Supreme Court, while the voting rights case Husted v. A. Philip Randolph Institute was argued in the court. Although the subject’s face is covered, Victoria makes direct eye contact with the individual, capturing stark emotions of uncertainty and concern. 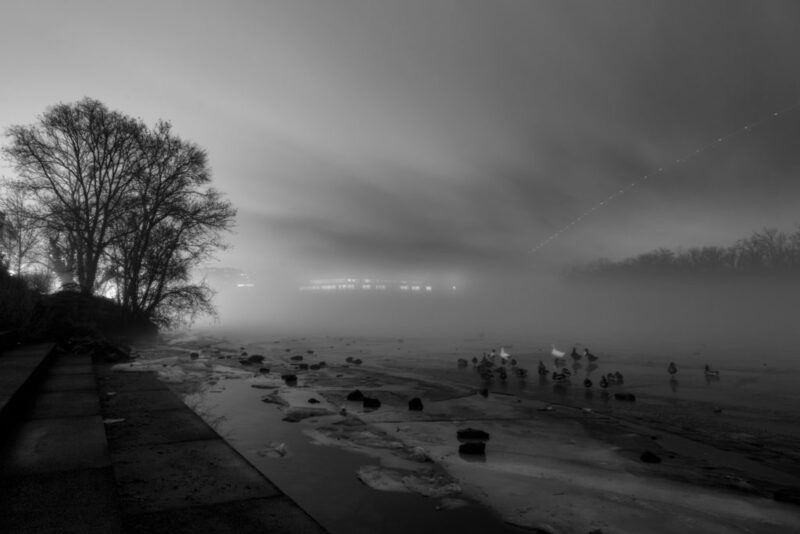 Photographing on a foggy day can be tricky for any photographer, as the air is full of water particles that redirect light rays across a landscape. However, this image by Mark Alan Andre demonstrates that when done well, photographing in such conditions can produce an ominous and alluring image. To do this, one must not be afraid to experiment with various aspects of their shooting process such as playing with longer exposure times as well as using a tripod or shooting handheld with a higher ISO. Great job, Mark! In this image, Joe Flood does a great job of framing his subject. The central framing of the extended ladder draws the viewer’s eye, guiding it up the length of the building. The angle of the camera appearing closer to the ground as opposed to eye-level exaggerates the perspective of the image providing a greater sense of depth. Experimenting with one’s perspective can freshen up your artistic style and result in a satisfying visual product.